The first was 60 Stoke Newington High Street in north London, the home of Albert N. Beck, Chemist (or his son; my information comes from a historical listing of the shops present on the high street in 1921). I would set out from our home in London SW6 on the #73 bus route (top deck) and it would take about an hour to arrive. On entering the shop, I ventured down a set of stairs into the basement to replenish the chemicals with sensible stocks, and purchase the odd glassware, filter paper, etc. And then venture back across London carrying the proceeds of many weeks, possibly months worth of hoarded pocket-money (apart that is from 1 shilling every two weeks which I reserved for football at Craven Cottage). At some stage, health and safety legislated against 12-year-old boys (and certainly also girls) purchasing chemicals in this manner! However, I can assure you all that I never came to any harm with anything I purchased at A. N. Beck and Sons. Apart that is from giving my parents a good fright. 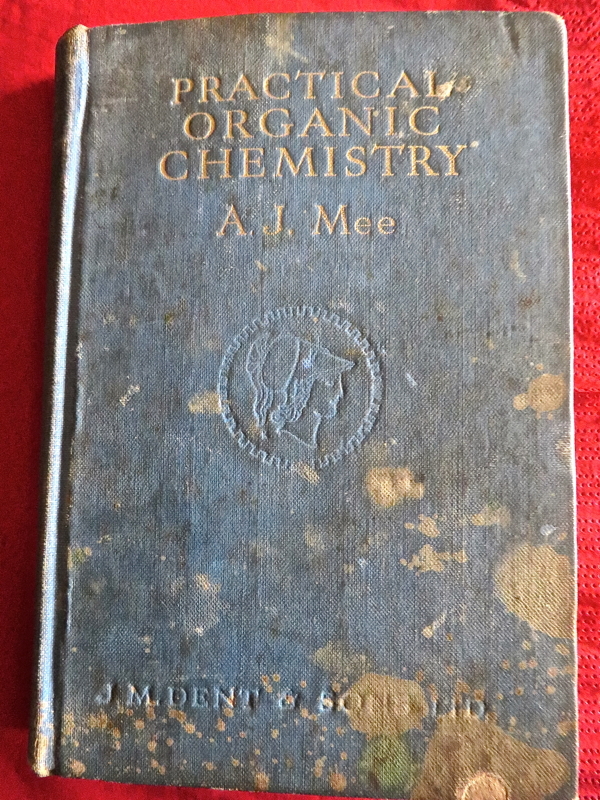 The second was coming across this book by A. J. Mee. I had thought it was well and truly lost; imagine my delight when I recently found it at home, complete with chemical stains, and dated as from a reprint in 1959. 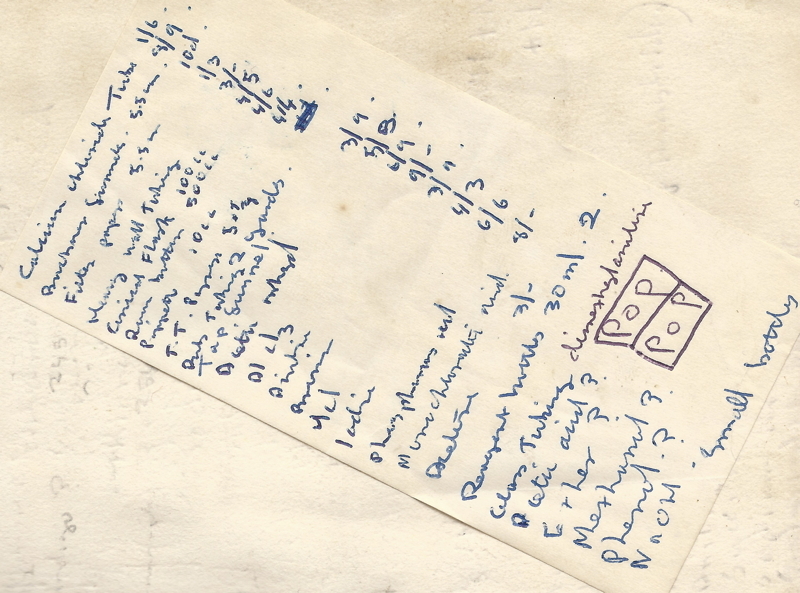 On the inside cover, I found one shopping list from my expeditions to A. N. Beck and Sons. The price 1/6 is the representation of one shilling and six pence (more than the price of a football match, or perhaps £50 in today’s money? I think football was much cheaper then! Oh, 1/6 is 7.5p in the decimal currency of today, or £0.075). Note that iodine was one of the items purchased. And note the wish list at the bottom! I was clearly starting to do organic chemistry. The pages of this book list 289 experiments, and I assiduously recorded a tick against all the ones I actually did. This is a typical page (click to expand). Thus expt 205 is the preparation of 1,3,5-tribromobenzene from 1,3,5-tribromoaniline (ticked), followed by that of o-cresol from o-toluidine (ticked). You can see how all the aromatic rings are still represented by what now looks like cyclohexane. This book gave me many hours of delightful recreation (I have not counted the ticks, but I think I attempted around half the experiments). Note in particular the huge scale these experiments were done at; 18g of product (I suspect I must have scaled them down a fair bit in order to preserve pocket money). Expt 198 was that of benzidine, of which I do recollect preparing ~2g. No warnings then about the extremely carcinogenic nature of this substance! Chemistry has certainly changed since then. Lost unfortunately is the laboratory book where I recorded my results, but one or two samples still exist! This entry was posted on Monday, December 22nd, 2014 at 5:01 pm and is filed under Historical. You can follow any responses to this entry through the RSS 2.0 feed. You can leave a response, or trackback from your own site. I wonder how many other children were given chemistry sets as a child and then went on to study/practice as an adult. I remember AN Beck and Son very well and the basement emporium. I loved to journey there from Harlow by train to Liverpool Street and then the number 73 bus. They were exciting times and I enjoyed hunting further afield and finding a chemist north of Birmingham city centre, Hoggs by name where I first got my own supply of bromine sodium and the materials to undertake the thermite process with my cousin in Edgbaston. They were exciting times when I learnt science in safety. I remember A Beck and Sons and ordering things by post! The strongest acid you buy was 10% nitric or sulphuric in a small medicine bottle. But my Dad said many years ago in the 1900s you could even buy white phosphorus at a chemist…even Becks would not sell that. As you say, happy times! And I never came to any harm either! Indeed being able to bur potassium permanganate enabled me to colour the school and escape detection because it had NOT been taken from the school lab. In the early sixties I used to cycle 12 miles from Enfield on a 14″ wheel bike to collect chemicals from Beck’s. If you had a letter from your Dad you could get strong acids and I remember riding carefully back with a burette sticking out of the saddle bag and Sulphuric and Nitric acid for making gun-cotton! I am still here to tell the tale and I have worked in laboratories all my life wherein H&S seems to prevent any experiments sufficiently exciting to enthuse new recruits? Talking of H&S reminds me of some asymmetry in the process of acquiring interesting chemicals from Beck’s. My regular visits stopped at the age of 18 when I went to university, but this did leave behind a small stockpile of the various acids and other stuff that could not easily be poured down a drain. My father eventually contacted the local council to ask how these might be disposed of. I do recollect the council officials being rather mystified by how this might be done, although it was eventually (and at no cost to my father as I recollect, or perhaps he withheld that information from me). I strongly suspect nowadays that such a request of a local council would certainly be accompanied by a very large bill indeed! In 1959 my sister Mary married Hugh Beck, grandson of Albert Beck, who was running the laboratory furnishing part of the business in the basement. Upstairs was an ordinary Chemist shop. I worked with Hugh for a while in 1965/1966 and left to work for Davey and Moore Ltd in Brimsdown, Enfield who manufactured glass laboratory ware. All the equipment A N Beck and Sons sold was proper laboratory equipment unlike the Lotts chemistry sets. The chemicals were in reasonably sized and priced bottles. I may well have served some of you at sometime. I received a letter recently describing a house clearing where two A. N. Beck catalogues had been discovered, dating from 1937 and 1938. Thanks Anthony for sending these catalogues; very much appreciated! The scans below show the front page of the 1938 edition, which I selected because it includes a four-digit phone number to the local exchange and an apology for 10% inflation! Inside, some items marked with a * (e.g. oxalic acid) can be sold only to approved students (one achieved this status I think by presenting a letter from a responsible person, quite likely a school teacher). This is their home laboratory, available for 42 shillings (£2.10 in today’s money), and including 80 chemicals (amounts are not described). The chemicals list is mostly inorganic; I think the organic items only came later. 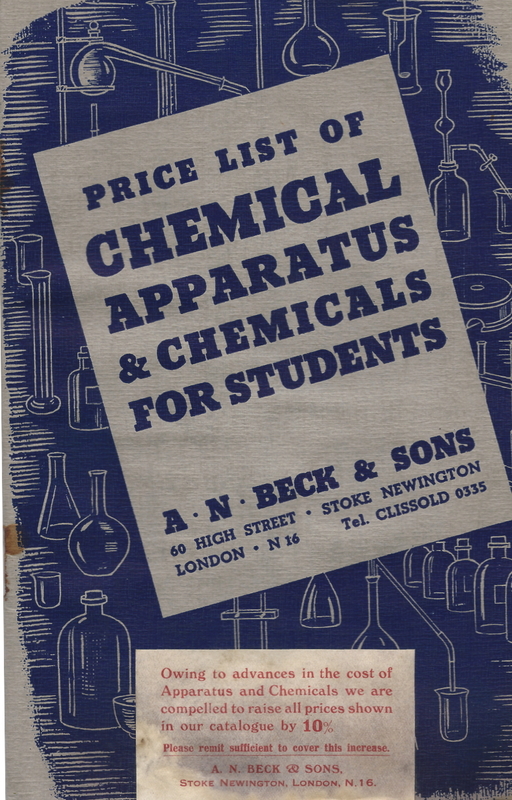 I fondly remember my trips to a chemicals shop in Stoke Newington – I think it must have been A.N.Beck – when on visits to London with my parents in the mid-late 60s when I was a young teenager. I stocked up with the most exotic chemicals I could find without being entirely sure what I was going to do with them – bromine. sodium metal, concentrated acids, potassium permanganate and others. In today’s climate it is surreal and amazing I was able to do this! What a wonderful memory Henry. I was just boring my wife with a story of long bus journeys to A N Beck to stock up with test tubes and concentrated sulphuric acid for my experiments in grandma’s garden shed in the early 60’s. She was doubtful a 12 year old could do that over the counter so I googled AN Beck Chemists. Lo and behold, your blog telling almost the identical story! Sadly I failed to be inspired to the same extent as you, Henry, going on to be an economist, then corporate treasurer, then headhunter. Thank you for taking a more useful path. I will add a further fond memory as a 12 year old of travelling across London by bus carrying odoriferous objects. One of my friends at the time had a father who was a greengrocer. On one occasion, he provided both of us with a very large sack of expired vegetables (might in fact have been cabbages, which have a lovely “aroma” when no longer “fresh”), and off we went on our own on the first London bus of the day to Regent’s Park Zoo, arriving around 06.00. We were allowed in via a side door by the keepers (without paying), and had the place largely to ourselves. I cannot remember the animals we were allowed to feed the cabbages to, but it might have been giraffes and elephants? Then back home, well before the zoo opened to paying customers. I was however clearly more smitten by chemicals than by animals. And, like the purchase of chemicals, I doubt 12 year olds are allowed into London Zoo at 06.00 to feed the animals any more. Indeed so, "risk management" (the term is a recent one) was engrained in childhood in those days. Another phrase might be "street wise", since most children spent much of their non-school time on the streets, in my case some also in tree houses on the banks of the river Thames and in our cases, the rest of it in our "laboratory". I certainly had several fires at home, none serious, and it taught one to remain calm and deal with them, since no-one else would. My chemistry set, augmented by supplies from A and N Beck, was what led me to science. I'm a mathematician now (that's what happens to scientists whose experiments don't work) but really I'm a closet chemist. I include here maps of the area of the shop; the nearest station is Stoke Newington and as I recollect it is down the high street (A10) from there. Note also Abney Park, one of London’s historic cemeteries. It is wonderfully overgrown, with an abandoned chapel at its centre, and many famous victorians buried there. Likewise, I remember going to AN Beck, in my case by buses from Upton Park, first with my dad and then on a couple of occasions on my own. I was 12-14 (1958-60). As a teenager in the north of England during the mid-1960s, I used to order chemicals and equipment from Beck’s which were always reasonably priced and promptly delivered. They had a way of making clever substitutions when they didn’t have quite what you had ordered, rather like supermarkets do today with their online shopping services. I also went to a local chemist in the town where I lived, who would supply me with practically anything, including concentrated acids, potassium chlorate (for making fireworks!) and quantities of mercury which I wanted for some electrochemistry experiments. The expertise I gained in handling these materials and, as has been noted here, the ‘risk management’ learnt along the way were invaluable when I started teaching Chemistry (which I’m still doing after 42 years). 1 Kipps apparatus (substitute) 3/6d. Sulphuric acid (dilute) 4 1/2d. which I greatly enjoyed reading, and finding so many “kindred spirits”! The 30 items in that list, so kindly purchased, formed the basis for my bedroom “laboratory”, and probably helped towards my achieving good ‘S’ levels (incl. Chemistry) 2 years later, so schoolboy enthusiasm for science – which I’m sure you shared – is certainly a “good thing”. Not a hark-back to chemical suppliers to students, but a parallel reference to that heroic age, is Lippy and Palder’s ‘Modern Chemical Magic’ (1959) which describes ‘Fired Liquid’ (aka ‘Liquid Match’), a solution of white phosphorus in carbon disulphide (a double-whammy for Health and Safety). The CS2 evaporates in seconds whereupon the phosphorus ignites. I know of one (elderly) demonstrator who still uses it. Other experiments for the brave are described. Ah, we are moving into the topic of memorable lecture demonstrations in chemistry. The famous Colonel Shaw used to tour the UK (and possibly further afield) in the 1970s and 80s. I suspect this would have been one of his demonstrations. Another, with possibly a further ingredient as oxidant (could it have been perchlorate) would sit quietly for 30-50 minutes, by which time the audience had entirely forgotten its presence. It would then explode with great gusto, and I can assure that this unexpected shock would quite literally make the audience jump out of their seats. I saw him give several lectures, and once, after the 50 minute mark had been reached, he had to give the game away to the audience by prodding it with a stick. We still all jumped. For me at least, an equally memorable demonstration was the release of fluorine gas from a cylinder. It was simultaneously a smell you knew you had never smelt before, but at the same time incredibly halogen-like and “familiar”. Unforgettable (even if the molecules that reached your nostrils were probably not F2 but F2O). I’ve come across an old box in my father in law’s shed whilst clearing it out. The box is marked MEDICINE -URGENT and is addressed to A.N. Beck and Sons of Stoke Newington. It contains 6 glass apparatus (Wood Bros)with some bungs, a small mortar and pestle, some filter paper, a tube full of ‘chalk carbonate’ and a tube full of ‘copper sulphate’……it also contained lots of saw dust and straw that the mice lived in. Can you suggest anywhere that might be grateful to take this? Having seen your posts it seems you know lots about the history. I remember ordering many items from ‘Beck’s’ in the mid 1960’s to furnish my attic laboratory at home. Spent many hours testing soils and doing experiments. My father even ran a gas supply up to the attic for my Bunsen Burner! It is true that way back then you could indeed buy anything chemical wise and have it delivered by post. 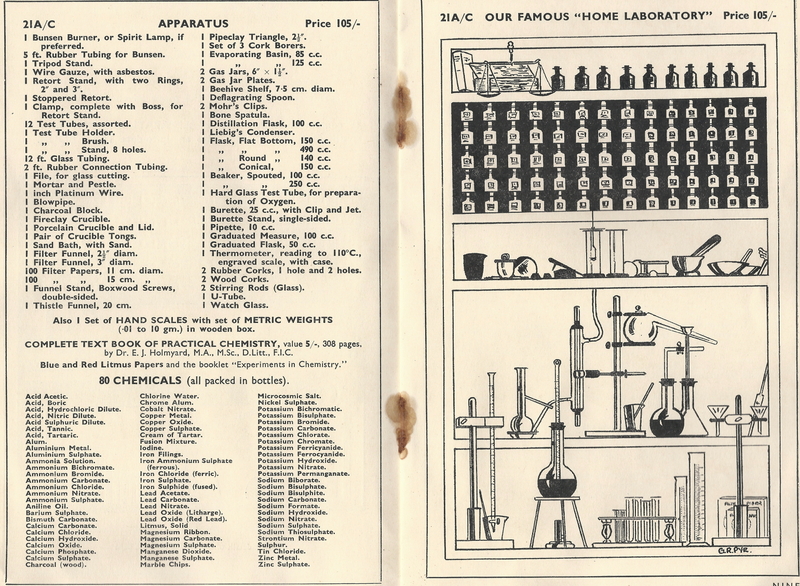 Today it would be frowned on to buy such items for a home laboratory. I eventually came top of my class at Science and worked in the Public Analyst’s Laboratory for a spell. It is a shame that there are no photographs of A.N.Beck’s shop, inside and out, it would be great today to see the premises from where we got our laboratory items from. Henry, you remember me as “Soss” from Laurie Phillips group … now when I was a schoolboy aged 15, me and two other boys used to buy stuff from Beck’s in the post, every few months we would put an order together for glassware, chemicals etc. I remeber the excitement when it all arrived, this was what got me into Chemistry (I was good at Classics and my very traditional school really wanted me to go that way). I had a whole room full of chemicals and apparatus! We lived in northern Essex and my father did take me to Stoke Newington once, to buy conc. H2SO4 and other nasty chemicals that could not be sent in the post, I was struck by how small the shop was. But I really remember with pleasure those times perusing Beck’s catalogue and gettng an order together. I did a Google search for Beck’s and that’s how I came to this blog. I just found this blog when i was searching for the name of the marvellous chemist’s shop in Birmingham (Hogg’s) where as a boy in the late 1960s I would invest my pocket-money in buying all sorts of exciting chemicals for my experiments. I went on to be a biologist and now, in retirement in Thailand, write books on science. I thank Prof Rzepa for his anecdotes and the other comments – actually I ended up as a prof at Imperial too, so that was a nice coincidence. Great memories of a time when you could get tins of chlorate to make rockets and go to the Midland Educational store and buy refills of cobalt chloride. I was also a very frequent customer of A N Beck’s in Stoke Newington High Street when I was a teenager attending the Hackney Downs School in the 1940s. Among my prized purchases were a Woulff bottle with two necks, gas jars and a beehive shelf. I also used to visit Griffin & Tatlock’s in the City and on one occasion picked up a large glass condenser for 3/6d which the bus conductor was rather reluctant to let me bring on to his bus as I was carrying it home. To obtain ammonium dichromate I visited a printers somewhere in Clerkenwell and received detailed instructions for photoetching copper plates, which wasn’t what I had in mind at all!! Fings ain’t wot they used ter be – no HSE or HAZCHeM to protect budding scentists in them days! I retired after 45 years a an industrial chemist, still with my fingers and eyes, and with fond memories of my early chemistry. I’d say the eponymous AN Beck was Albert Neve Beck, who indeed died in 1921, the date of your address list. His address was given as 9 Summerhill Grove, Bush Hill Park, Enfield. His widow died in 1927, her address was nearer to the shop, at 7 Ardleigh Road N1. Probate was to their two daughters – Gladys Greenwood [m 1923] and Constance Dean [m 1921] both born in Southwark, in the late 1890s. It’s not clear if AN Beck had any sons [you’d need to look at the family in 1901/11 censuses] so it may not have been a Beck by name running the business when you were a visitor. A fascinating story and thread, about which I knew nothing. sorry, ignore my earlier comment, I missed the mention of Carl [1889-1965] and Kingsley above, Kingsley being, I guess, Hugh Kingsley Beck. [1901-1970]. Just stumbled across this blog, which brings back fond memories of travelling to Beck’s in the mid 60’s with my dad, taking the 29 bus from Wood Green. We would walk across Clissold Park to the shop and I would present them with a list of chemicals and equipment. Amazing to think now what I could purchase back then with my dad’s agreement. Like others I started with a chemistry set and expanded from there. My favourite pastime was making home made fireworks and explosives, which I would use to blow up my Airfix kit ships, set off by dripping warm glycerine down the funnel onto potassium permanganate crystals as I recall. I still have some test tubes, and bits and pieces in the garage and my old chemistry text books. I continued my interest through to 6th form And did well in chemistry, but it never led to anything in that line as I now work in IT. I had a few hairy moments, and some unscheduled explosions, but never came to any harm. I think we were allowed to take more risks as youngsters back then, and discover the dangers for ourselves. Your comment about Craven Cottage made me smile, because at that time I was making the journey in the reverse direction from North London to Stamford Bridge – I’m still making that journey, but from Enfield. I recall making frequent trips to Beck’s in the mid-1960s. I lived in Peterborough and used to call in there on each trip to London, to stock up my home lab, taking the 73 bus from King’s Cross. Also remember buying large tins of sodium chlorate for 2/6 from a garden shop – more than enough for a big bang! Halcyon days of my youth. Fortunately, I went on to become an academic rather than a terrorist. 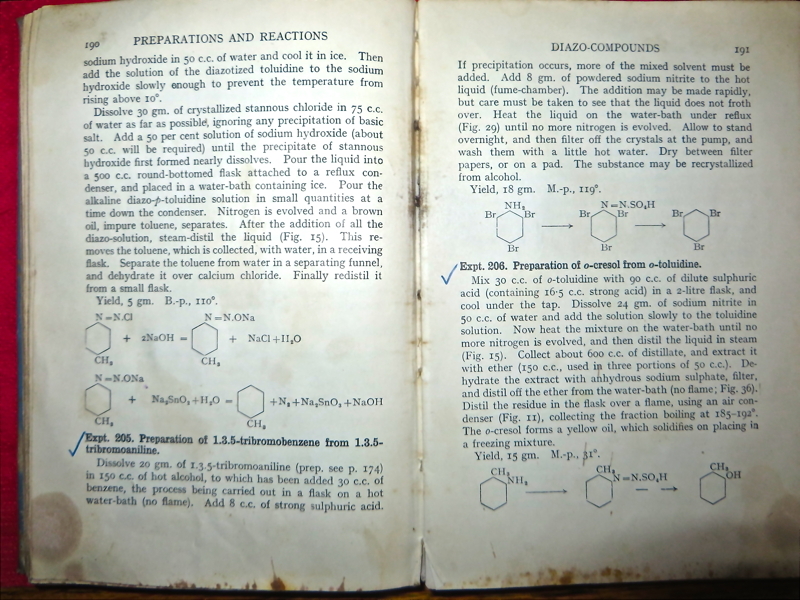 Chemistry in the early 1960s: a reminiscence. is licensed by Henry Rzepa under a Creative Commons Attribution-Noncommercial-Share Alike 3.0 United States License.